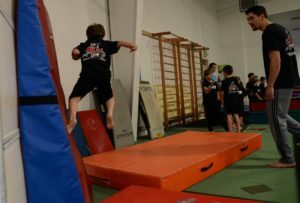 Ninja Zone is a nation-wide program that’s grounded in a mixture of martial arts, gymnastics, and freestyle movement. Your child will combine these practices to create ninja-style moves that are used to conquer challenges and elude (imaginary) opponents. The result is a skill-based, fast-paced, fun program geared for children who have enormous energy and are looking to boost their coordination and athleticism. 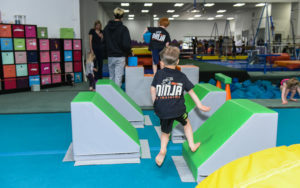 While Ninja Zone develops your child’s coordination and strength (and is tremendous fun), it also helps builds character and cultivates discipline. Ninja zone instills values like creativity, practice and patience. It also gives your child the confidence to take on new challenges and problem solve. 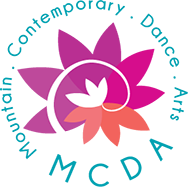 We believe that children who learn to channel their impulse and energy toward a focused goal will succeed in all endeavors! Ninja Zone classes at Mountain Kids are also grouped by skill level. New students above the age of 3 should register for Ninja White, and we will group them according to age. Lil’ Ninjas is the entry-level class for our youngest ninjas. Class goals include listening skills, confidence, trying new things, working through frustration, and manners. We do all this through a strategic mix of skills and progressions. Training for fundamental body movement, basic skills including Ninja rolling for safety, backflip progressions, basic vaulting, wall & bar progressions, development of core strength and speed. Safety techniques for falling, landing and transitioning are strongly emphasized. Progression from basic skills to more intermediate/advanced skills including backflip progressions, basic vaulting, wall and bar progressions, development of core strength and speed. Mastery of all safety techniques & ability to follow Ninja standards in focus & taking direction. Skills mastery of beginner progressions (ex: rolling, hand support, spotted flipping, wall progressions 1 and 2, precisions, kicking technique, & basic transitions). Introduction to solo flipping, basic jump+kick+flip combos, turning and flipping, window escapes, etc. Emphasis on jump+kick+flip combos as well as more advanced strength and agility (example: 16 ft. rope climb). Continuation of previous levels with advancement in the difficulty of combos. Introduction to combos used in The Ninja Games. Ninjas with mastery of skill combinations will be invited to participate in a mission to level up! In an effort to promote discipline and unity, Ninja Zone requires all ninjas to wear uniforms (t-shirt & headband) for all Ninja Zone classes. Ninja HQ will ship your child’s uniform — along with Top Secret tips from Ninja Nic — directly to your house for free. Enrollment for Ninja Zone classes is continuous. Sign Up for Ninja Zone Now!